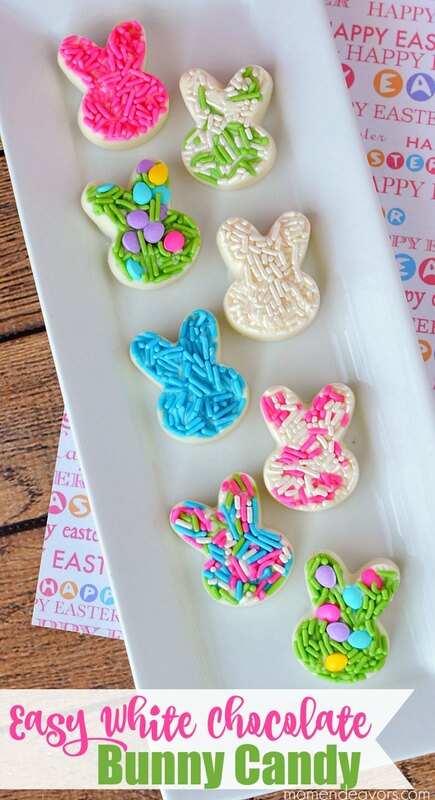 Need something fun for your Easter meal or your Easter baskets, these easy-to-make white chocolate bunny candies are sure to be a hit! Aren’t these little bunnies cute?! I love all the bright, spring colors! But what’s fun about these little treats is that they are SO easy to customize with any toppings you’d like. These could be used as place cards for your Easter dinner table or you could just put them out as part of the desserts on a tray (just like in the picture). They would also be perfect to go in Easter baskets. 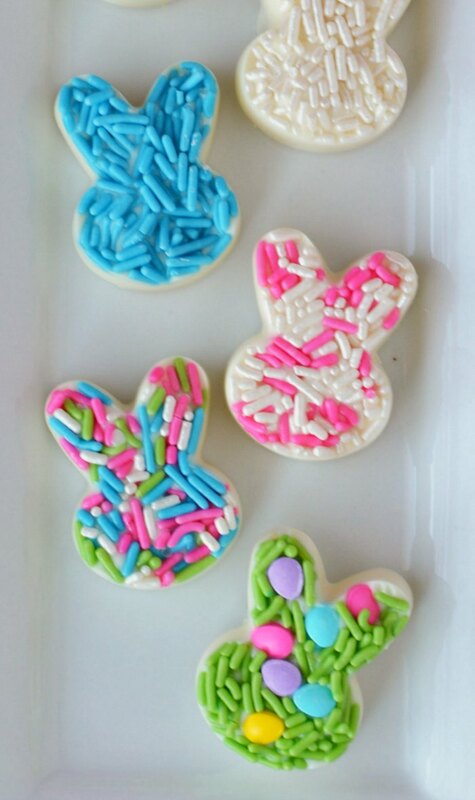 OR if you could like a fun activity to do with the kids, these bunny candy treats are perfect for that too! Place the bunny shaped pan onto a baking sheet and clear a space in the refrigerator that’s level for the baking sheet. Remove from the refrigerator. Sprinkles 1st!!! 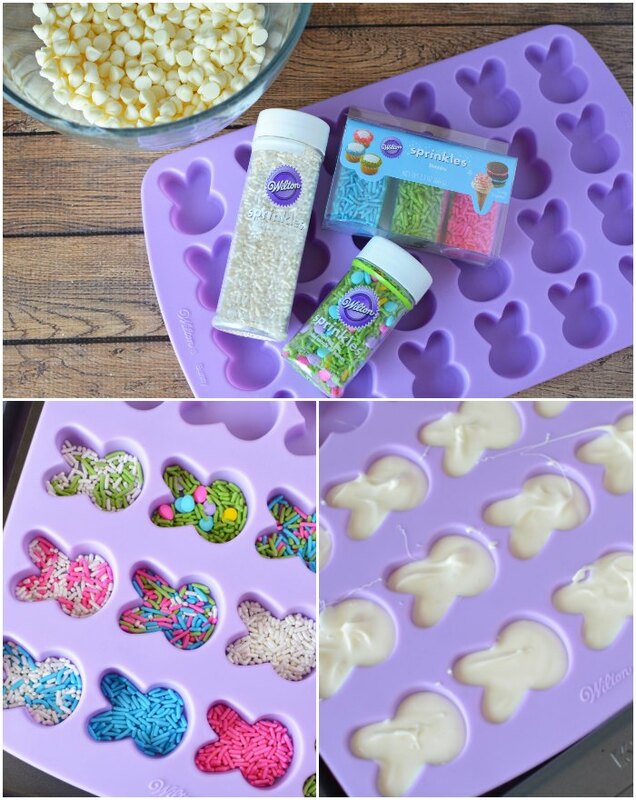 Place sprinkles of your choice into about 18-20 cavities in the bunny pan. Just cover the bottom layer. Mix and match sprinkles and jimmies as desired. I’d suggest doing at least 16 cavities with sprinkles and going from there. It’s much easier to add more sprinkles, rather than have to take any out that you have not used. In a microwave safe container, microwave white chips for 2 minutes on high, stirring every 30 seconds until melted. Pour into the bunny cavities and tap gently on the counter to settle the melted candy. See?! Super easy & fun to customize! Enjoy and have a Happy Easter! YUMMY, Add a stick and you have Easter Bunny pops. There are so many cute sprinkles on the market, too.